The following table summarizes the technologies and results of research that were protected by intellectual or industrial property rights, the situation of each of the intangible assets as well as most relevant technology transfer and valorization activities. The Computational Laboratory Web Manager (cLab) is a web portal that permits the access and the management of a computational laboratory, which is a high performance hypercomputation center based on heterogeneous clusters of computers and used by multiple users simultaneously for the execution of computational jobs. cLab is an internet based application that allows users to manipulate files and folders, prepare computational tasks, submit and control them while they are running, as well as visualize or store results. cLab therefore provide tools for the users as well as for the system administrator. A concave compound self assembles thanks to reversible and controllable hydrogen bonding to form a dynamic capsule able to selectively extract fullerene derivatives of given size and shape. The process for the separation of fullerene derivatives is based on a sequential selective encapsulation in an appropriate solvent system of the fullerenes contained in a mixture. The capsule is formed by reversible self‐assembly of two concave fragments. The encapsulation of the fullerene derivative having the best fitting geometry for the cavity of the capsule is fast and selective. A process for the direct cupration of fluoroform has been developed. This exceedingly simple process employs only cheap reagents and is advantageously run at room temperature to produce CuCF3 reagents that are useful in trifluoromethylation reactions. Chemical compounds bearing a trifluoromethyl group are widely used in the production of various pharmaceuticals and agrochemicals as well as specialty materials, polymers, composites, building blocks, and intermediates for various needs. Fluoroform, CF3H, is an ideal source of CF3 because it is inexpensive, readily available in large industrial quantities, non‐toxic, and not an ozone depleter. The technology has been the object of a R&D collaboration between ICIQ and a global company of the crop protection sector, with the aim of finding new synthetic applications of industrial relevance for the developed trifluoromethylating agent. 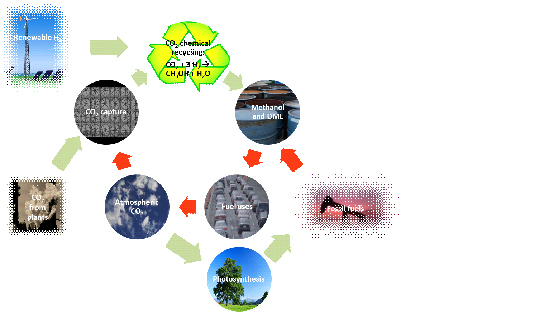 Chemical reduction of carbon dioxide to methanol and its derivatives (such as DME) is considered one of the key technologies to reduce both global warming and fossil fuels dependency. Unlike the currently used process for methanol synthesis, ICIQ’s process provides excellent conversions and selectivity to methanol in one pass through the reactor, thereby providing the highest time yield observed for the chemical reduction of CO2. This technology has been the object of negotiations and scheduling of a joint development project associated to a progressive technology transfer scheme with a global petrochemical company. In spite of successful early negotiations, the company finally decided to retract. Plans for the creation of a spin-off company are currently being elaborated. Web and Command Line (bash) interface. Automatic generation of “Supporting Information” PDF files for direct publication. A nanoparticle containing two different populations of chromophores and funcionalized with a dye-labelled peptide sensitive to the action of a hydrolytic enzyme has been developed. In that way, the optical response of the system can directly be correlated, in a quantitative manner, to the activity of a specific enzyme found in the medium where the nanoparticle is placed, thereby allowing for enzyme quantification. This technology was applied to cystic fibrosis, through the analysis of the trypsin amount of faeces samples. It was shown that this system could allow for the determination of patient’s phenotype, thus avoiding genetic testing. This technology has been further developed within a project of clinical validation of the diagnosis method funded by Fundació La Caixa. The cystic fibrosis application is currently the object of clinical trials in collaboration with Parc Taulí hospital in the framework of an ERC Proof of Concept project. Benzene is a volatile and toxic organic compound with strong regulations with respect to exposure. 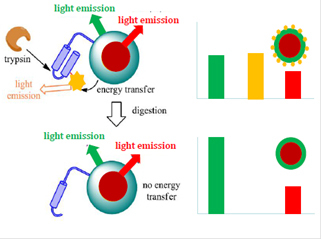 The developed sensor is highly sensitive and selective to benzene, and is based on a specific molecular receptor linked to a carbon nanotube through gold nanoparticles. Benzene recognition by the receptor provokes a bending of the nanotube, which affects the resistivity of the system. no latency between two consecutive measurements. This technology has been developed in joint collaboration with the Rovira I Virgili University. A prototype is being developed by the group of E. Llobet at URV and discussions are ongoing with a catalan company for technology licensing and joint development. A new catalyst based on nanoparticles of cobalt oxide and carbon black has been developed for the generation of hydrogen from water in Polymer Electrolyte Membrane cells. Under high applied potentials (i.e. 2-3 V), the catalyst allows reaching a productivity of hydrogen similar or superior to that obtained using conventional platinum based expensive catalysts. A potentiometric sensor based on a calixpyrrole receptor specific for creatinine recognition has been developed. The sensor is highly sensitive to creatinine, a biomarker relevant to muscle operation and kidney function. Creatinine quantification in urine samples correlates well with state of the art enzymatic methods (Jaffé). This technology has been developed in joint collaboration with the Rovira I Virgili University. The URV team is participating to the first edition of the “Caixa Impulse” program and is willing to create a new company for technology development and commercial exploitation. New unsaturated analogs of (-)-Englerin A, a natural product highly active for the treatment of renal cancer, have been developed and found to be more active against certain types of cancers than the natural product itself. This technology has been developed in joint collaboration with the National Cancer Institute (NIH, USA). The technology has been exclusively licensed to NIH for commercial exploitation and licensing to third parties. A new method for the synthesis of pyrrolidine compounds and other heterocycles have been developed. The method involves the use of catalytic amounts of iodine and an oxidant under light irradiation, the substrate of the reaction being a butylamine derivative, which undergoes intramolecular cyclization under the conditions of the reaction. A new polymer-bound catalyst based on a fluorinated proline derivative for nitroaldol reactions has been developed. The catalyst is prepared by co-polymerzation and is highly active, robust and recyclable, while offering a high chiral induction in nitroaldol reactions. 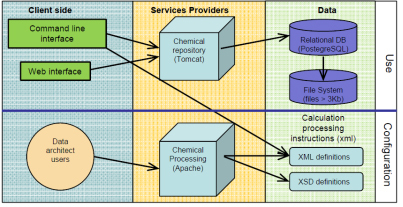 ioChem-BD is a piece of software allowing for the handling, storage and management of the output files of computational chemistry experiments. 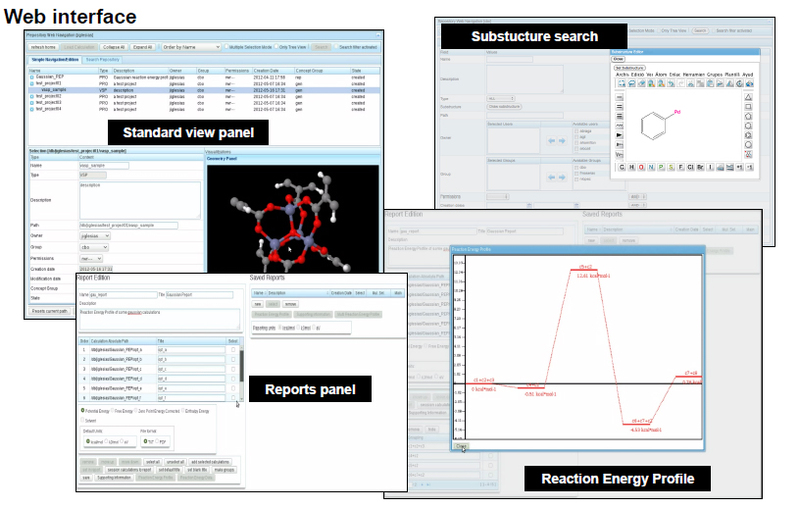 ioChem-BD allows for substructure searches and the generation of reports and ready-to-publish materials to make the life of the computational chemist easier. Automatic creation of pdf files for ready to publish materials. Computation and draw of energetic profiles for chemical reactions. This technology has jointly been developed with the Rovira i Virgili University. Conditions for joint ownership have been determined and the distribution of the software (beta version) has been launched This project is benefiting from a ERC Proof of Concept grant to ICIQ. A sample holder equipped with a circuit of optic fibers and a lens system has been developed, so that it allows the measurement of the spectroscopic properties of solids and other materials when those are placed under controlled environments, such as within a magnetometer or a cryostat. This technology has been granted an ERC Proof of Concept grant for the development and commercialization of the sample holder. Project is to be started in 2016. A tert-leucine derivative has been successfully anchored onto a polymeric support and shown to be a highly active and selective catalyst for the preparation of the Wieland-Miescher and Hajos-Parrish ketones from readily available starting materials. This catalyst allows for continuous flow preparation of these key building blocks, for the large scale preparation of several natural products and pharmaceutical ingredients. This technology is part of the technology portfolio to be exploited by the technology platfor ErtFlow, created in 2015 to foster a paradigm change from batch to flow processes in the fine chemical industry. 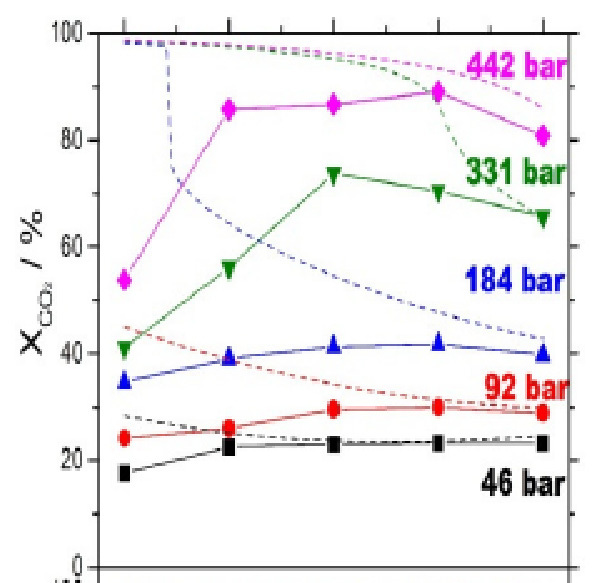 Carbon dioxide is hydrogenated to methanol under high pressure conditions in almost quantitative yields in the presence of stoichiometric amounts of hydrogen. 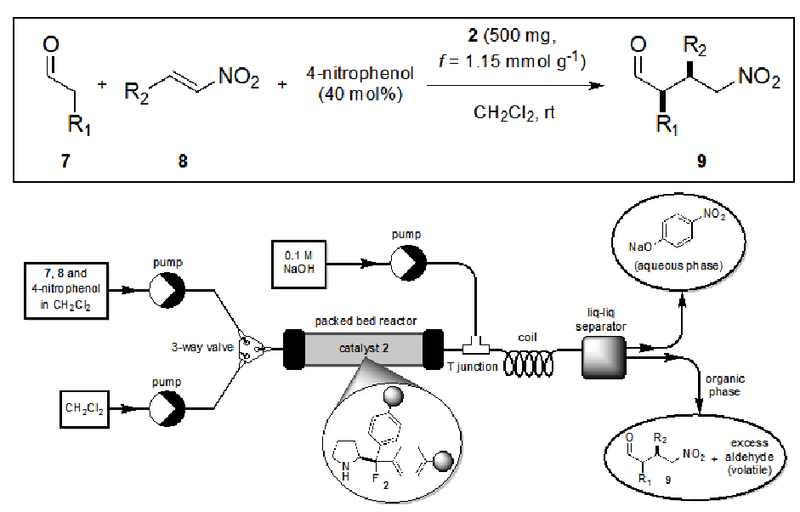 The process is a catalytic heterogeneous process, operating under flow conditions and using a commercial, conventional, methanol synthesis catalyst. Productivity of up to 15 g of methanol per gram of catalyst and per hour can be reached. Plans for the creation of a spin-off company are currently being elaborated. La Caixa foundation funded the set-up of a pilot plant operating this process at 1 TPA scale during 2016. 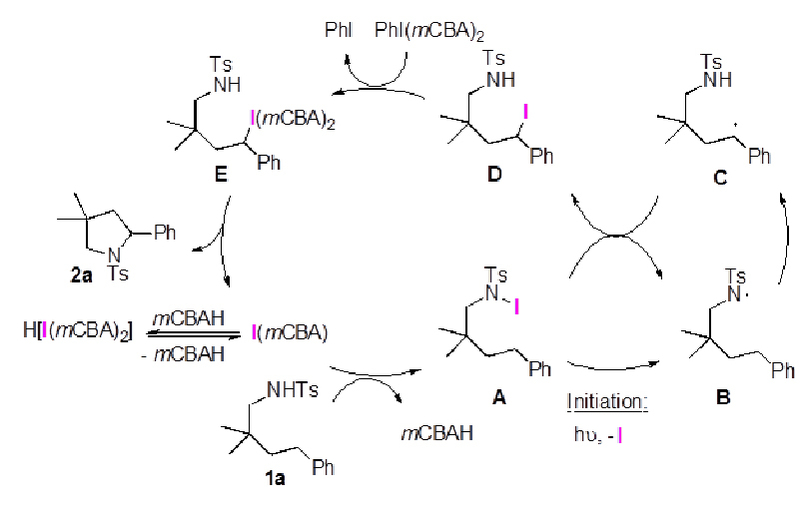 Olefins and secondary alkyl bromides are carboxylated under mild conditions using a nickel (II) catalyst with a phenanthroline derived ligand. The process goes through a “chain-walking” event, meaning that, regardless the position of the bromine atom or the double bond on the aliphatic chain, CO2 will incorporate in terminal position. This process allows for the preparation of a terminal carboxylic acid from a simple hydrocarbon, using non-selective radical bromination, followed by this regioconvergent process. The technology is the object of a granted ERC Proof of Concept project, started in June 2016. Hydrogenated polyacene compounds are readily prepared in a limited number of synthetic steps using a gold-catalyzed intramolecular cyclization reaction as key synthetic step. The reaction proceeds in mild conditions and exhibits a wide substrate scope. The corresponding unsaturated polyacene compound can be obtained by simple oxidation of the compound. Polyacene compounds are widely used as semi-conductors and as organic electronics. The technology has been the object of ERC Proof of Concept project application. A R&D collaboration aiming at developing applications of new polyacenes in organic electronics has been shaped with ICMAB-CSIC (Barcelona). A copper (II) based metal organic framework (MOF) is readily prepared from a triazol substituted histidine derivative. 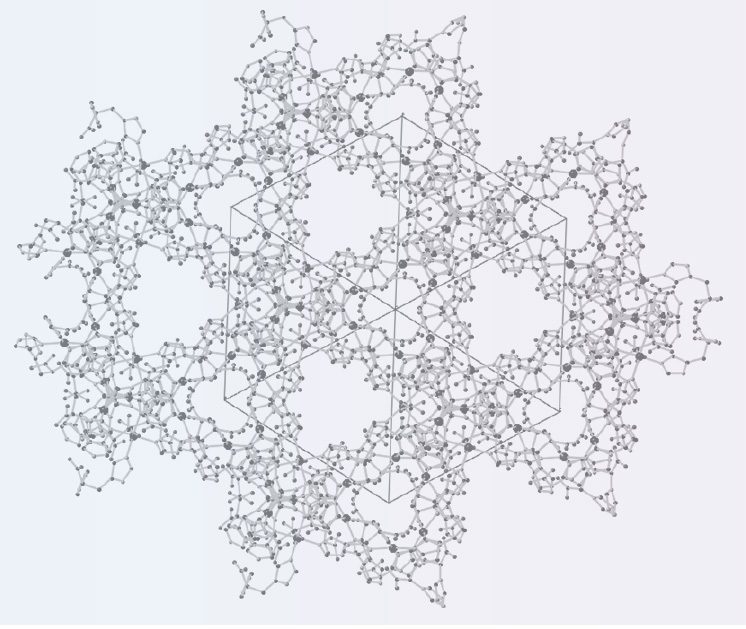 The MOF is stable and exhibits good gas absorption properties as well as chirality. The MOF has been proven suitable for CO2 separation, catalysis applications (CO2 hydrogenation, asymmetric catalysis) and chiral resolution. 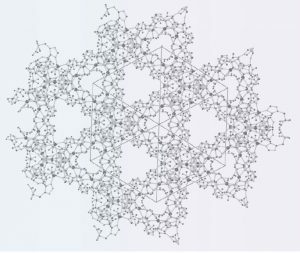 In particular, the MOF offers the possibility to carry out CO2 separation in a continuous manner. La Caixa foundation funded a project for the development of composite materials including the developed MOF as compoenents of gas separation membranes. This technology, among others, is aimed at being transferred to a spin-off company in charge of its commercialization in the clean technology field.